At first glance, Smith Westerns seem to be pumping out some nice, unoffensive indie rock, but further listens see a band busily carving out a niche for themselves. Sure, they're reverb-laden, they've got those fuzzy guitars, and there's often something about Dye it Blonde that recalls dream pop — and bands that fit those short descriptions aren't in short supply. I'm looking at you, "glo-fi" and "chillwave" proto-genres, but that discussion's best saved for another day. One might be keen on shoving Smith Westerns into those nefarious pigeonholes, and it’s hard to blame them on face value. Really, there are some common elements between the band and the loose movement, but Dye It Blonde is considerably closer to effective power pop than it is any blog-hype genre. It's noisy, fuzzy power pop, but the best always was, wasn't it? Where the first album from Smith Westerns — a self-titled release — is undeniably lo-fi, this is something a bit more measured and prepared. Smith Westerns could have lost it all by moving to this clean, crisp sound, but they retain more than enough of their style to remain palatable to fans of their first, but approachable to people whose only adventures into lo-fi consisted of, say, Guided by Voices. It's easy to lose sight of it all when you enter the studio and take a more calculated approach to recording music — and it's a problem that becomes more acutely recognized when a band's debut is recognized and appreciated. 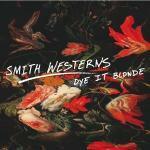 So, if the first Smith Westerns release is the band at its fiery, evocative beginning, where does Dye It Blonde leave them? The name suggests a falseness, but I'm not convinced that's played out musically. If tape hiss and low quality microphones are what make music genuine — or, at least, what makes Smith Westerns genuine — then there's been nothing quite as good as that first crackling recording by Thomas Edison. Or there's been nothing as real, I suppose. Ultimately, Dye it Blonde is as real as it needs to be, and the resulting effort sees Smith Westerns come out of the studio with something perhaps more euphoric — when you can hear each separate instrument and discern parts more easily, the focus can shift more to some of the higher-level musical ideas at play. Their first outing isn't without its charms and graces, but this features Smith Westerns focusing in on the things that really succeeded the first time around, then fixes up that with some more of their songwriting style. Smith Westerns have cleaned up their act, and the result isn't just sparkly, it's damn good.